Today was the 60th anniversary of the first landing and establishment of Mawson station. We declared today a public holiday for all Mawsonites and we planned to celebrate with a series of events to honour those that came before us. We were planning on having a BBQ in Weddle hut and then watching some old movies in Biscoe hut. Both of these huts were the first huts erected in 1954 during the first landing. I printed a heap of colour photos from the 1960 expedition and put them up in "exactly" the same position where they were taken. It was a fun challenge to work out the locations and an eerie feeling too as these two building have changed quite a bit over the years. When you look at these old buildings all you see are old buildings, but when you see photos of all the life, happy times and celebrations that have gone on inside them over the past sixty years they really come alive and have their own character. Once done setting up I went and had brunch at eleven o'clock which was a special spread of croissants and smoked salmon. At eleven thirty I had arranged to have a conference call with Syd Kirkby and George Cresswell who were fellow expeditioners with my step father Bill Kellas here at Mawson in 1960. Syd has had an incredible career as a surveyor and holds the honour of exploring and surveying more Australian territory than any other explorer including Burke & Wills or Charles Sturt. George is an honorary research fellow at CSIRO and was an Auroral Physicist here at Mawson. He has had an amazing 4 decade career as a physical oceanographer working in Australia and SE Asian water. George also has the honour of bringing the first motor bike to Antarctica. Both Syd and George are very funny and witty men and true gentlemen. Our phone call lasted over an hour and they had everyone captivated with funny stories and anecdotes about early station life. Chairing the call was fun and I managed to dig up some dirt about each of them and we all had a fabulous time. We the 66th ANARE were honoured to have two such great and inspirational expeditions join us for the 60th anniversary of Mawson station. After the call I went down to the old station to fulfil a promise I made when I first got here to clean out all the old buildings. The three original remaining accommodation buildings Shackleton, Wilkins and Dovers all looked like squatters have been living in them and I spent six hours thoroughly cleaning them out and they now look fantastic. I have also made up signs to place in them telling the name, the building use, age and a note about them being heritage and to look after them. I took some time out as we all gathered out on the end of West Arm to unveil the new Mawson sign Terry had made up to replace the aging and faded old sigh. We all raised a cup of champagne and toasted those that came before us and also our family, friends and loved one left behind. Late in the afternoon we all gathered in Weddle for a BBQ and a few drinks and afterwards we all moved into Biscoe where I played a few old movies including "Blue Ice" about the original landing at Mawson in 1954, a movie of the 1960 expedition, Harry Munstermann's narrative slide show from the 1960 expedition and a slide presentation by Dave McCormack. It was a nice day and worked well and later everybody gathered in Klub Katabatic for a few beers, darts, pool and movies. 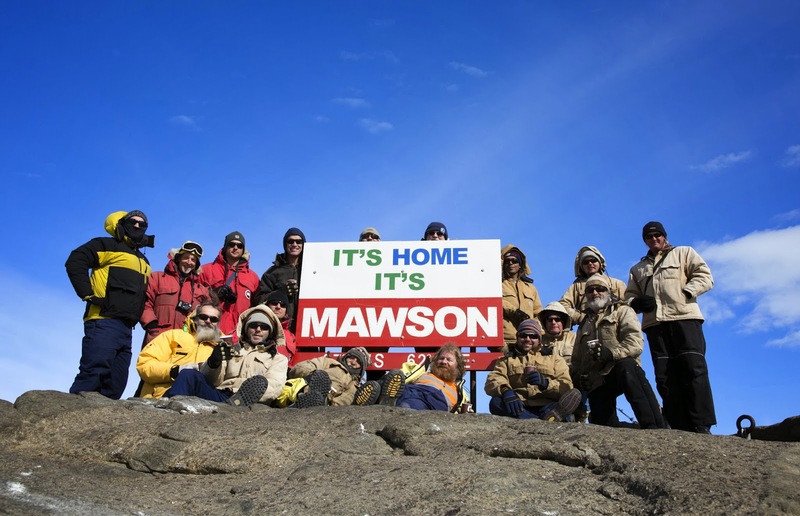 I Love That Sign"its Home Its Mawson"